After a memorial, tombstone or headstone has been installed, it is subjected to all manner of weather conditions and depending on its location, many environmental elements and pollutants etc. 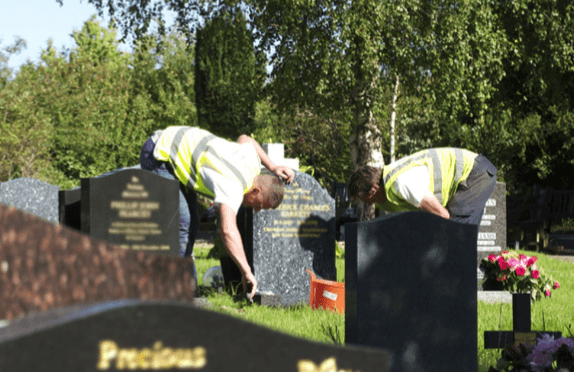 It is therefore an important consideration to have memorial maintenance and have your memorial regularly cared for. There are many factors today that mean it is not always possible for everyone to be able to tend to their memorials on a regular basis. Many of our clients therefore utilize our extremely popular Memorial Maintenance Service. Having a memorial, tombstone or headstone professionally maintained provides you with peace of mind and is a wise investment. At Summers Memorials, pet memorial maintenance is offered as well. The memorial receives regular visits throughout the year by our trained and skilled staff. During each visit the memorial is professionally washed, cleaned and tended to, the grass surrounding the memorial is trimmed back and the memorial checked and inspected for any problems.